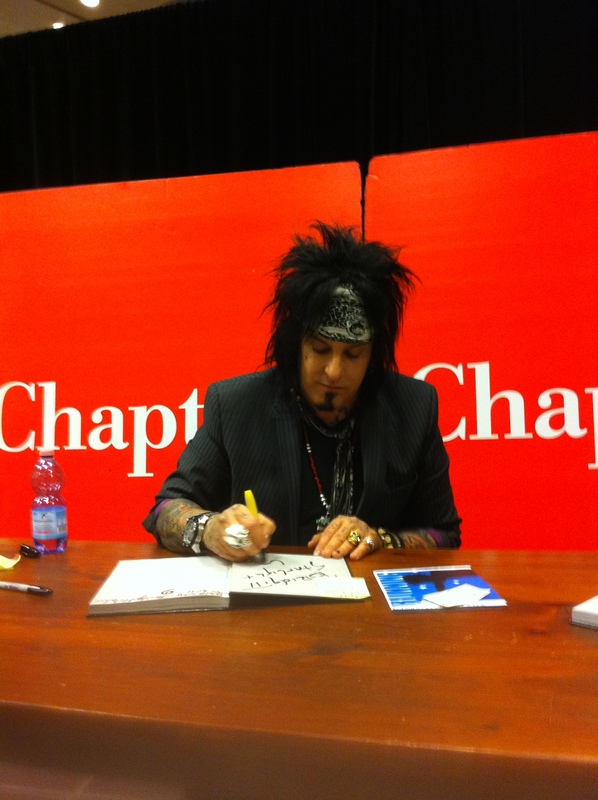 When we got there on the day of the signing the place was a total zoo (apparently there are lots of Crüe fans in Toronto!) 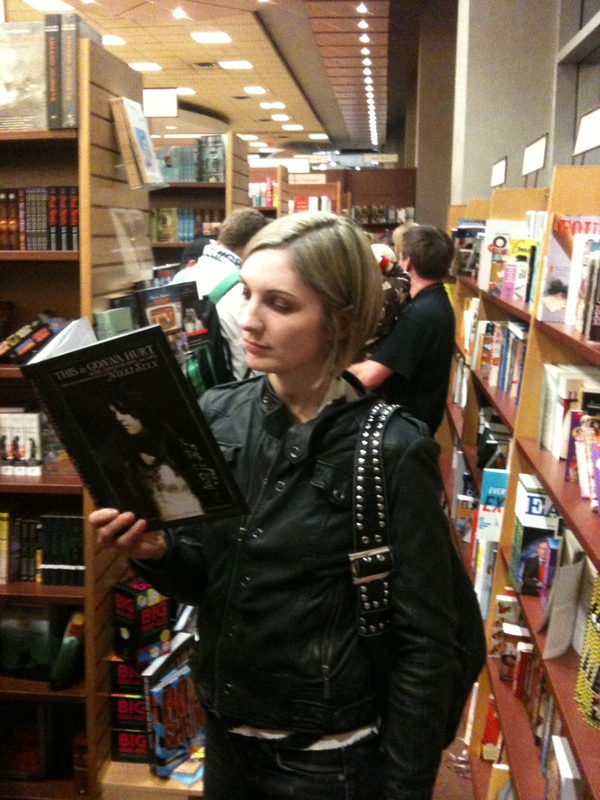 but AS LUCK WOULD HAVE IT, I had a book in hand to pass the time away as we waited for our face time with Nikki. I started reading and was so engrossed that I basically left poor Thinfinn to fend for himself. Thankfully he is a gregarious type and became fast friends with the girl in front of us in line and the couple behind us, Darnell and Jenn, who were awesome. 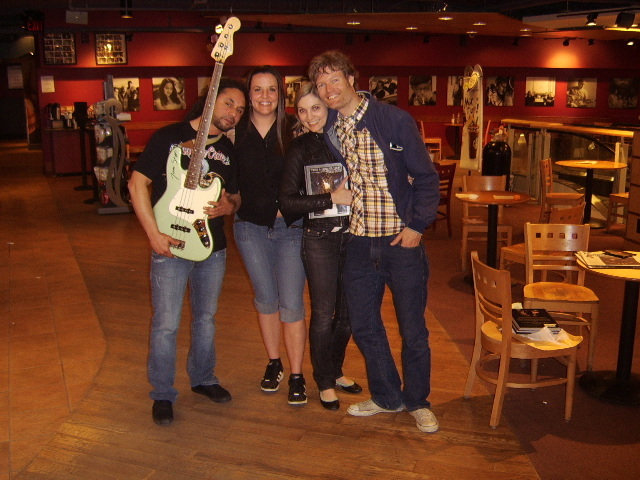 Darnell is a bass player and had brought along his bass in hopes that Nikki would sign it. 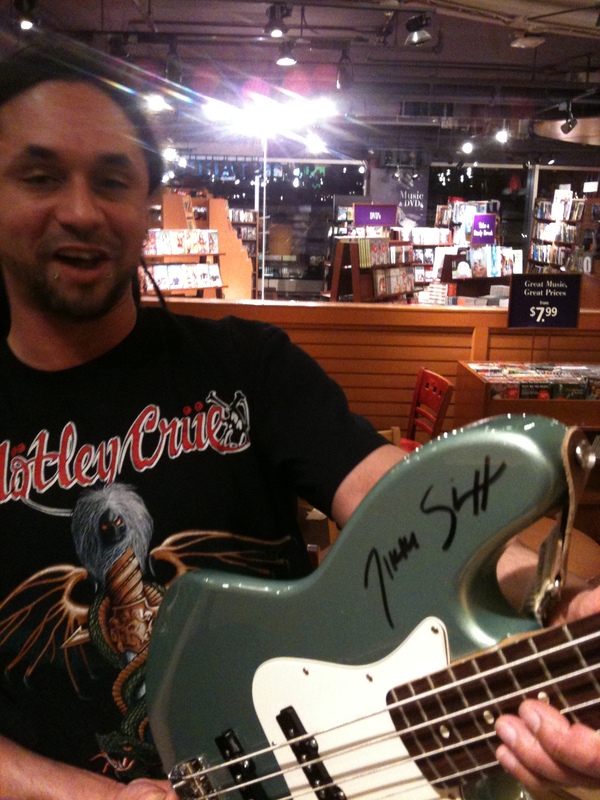 The bookstore staff were going around saying that he would only sign books and CDs, but we assured Darnell that a rad dude like Nikki would not turn away a fellow bass player. Anyway, after a veeeeery long wait (like seriously, y’all, it was hours. 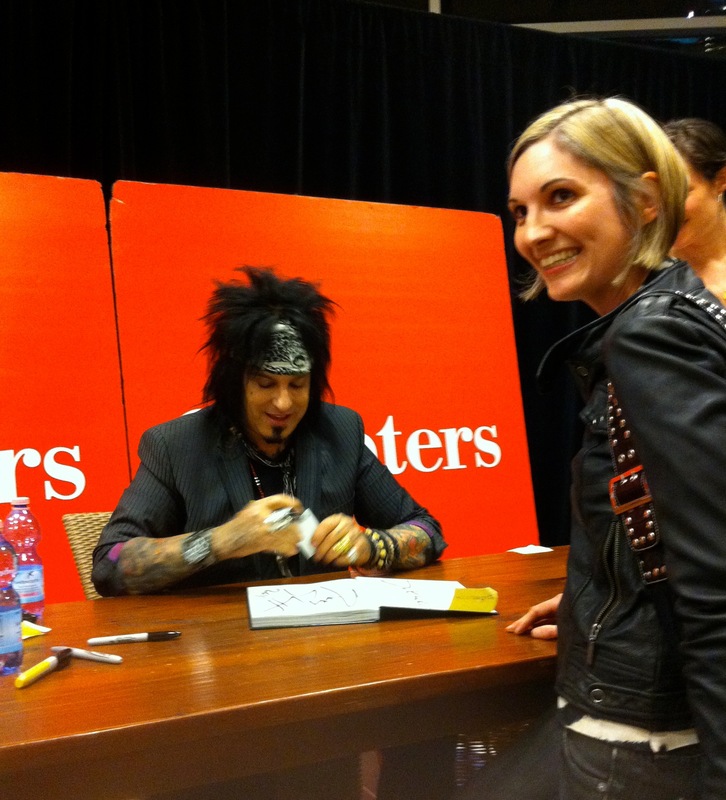 But he was taking his time with each person in line, which I fully respect) I got my book signed and exchanged a few words with Nikki. I told him about Let Them Read Vinyl and explained his position as top marks in our book review grading, which elicited a smile. 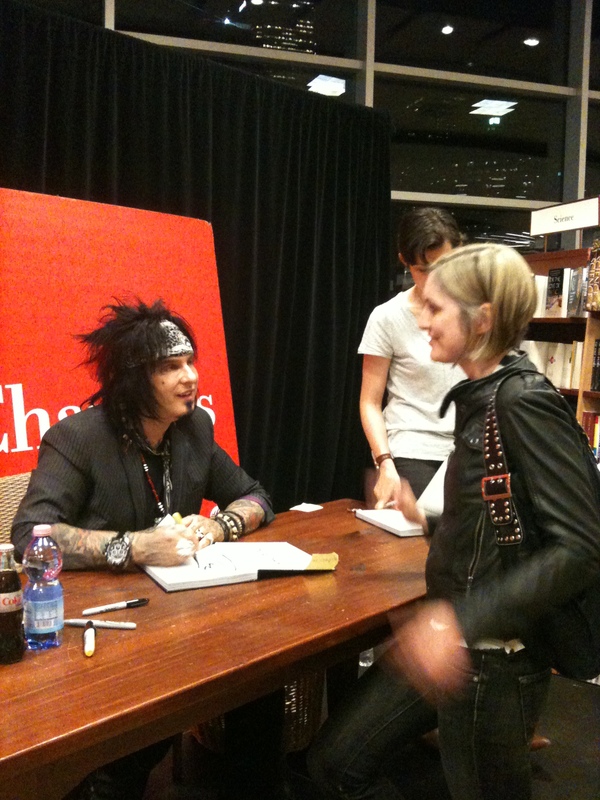 He was gracious and friendly, and seemed quite honoured at the turnout. I’d pass up the opportunity, did you? And as for Darnell’s bass…? Yeah, of course he signed it. Was there ever any doubt? Up next is our review of This is Gonna Hurt, so check back soon! This entry was posted on Thursday, June 2nd, 2011 at 11:29 am	and tagged with anti-hero, drug abuse, read this now!, rock star style, the '80s and posted in I Love Music. You can follow any responses to this entry through the RSS 2.0 feed.